Diffusion is one of the basic mass transport mechanisms, which is involved in the control of drug release from numerous drug delivery systems (14-16). Fick was the first to treat this phenomenon in a quantitative way (21), and the textbook of Crank (22) provides various solutions of Fick's second law for different device geometries and initial and boundary conditions. A very interesting introduction into this type of mass transport is given by Cussler (23). Figure 2 Classification scheme for predominantly diffusion-controlled drug delivery systems. Only spherical dosage forms are illustrated, but the scheme is applicable to any type of geometry. Stars represent dissolved (individual) drug molecules, whereas black circles represent undissolved drug excess (e.g., crystals and/or amorphous aggregates). are called primarily "diffusion controlled." According to their inner structure, three types of diffusion-controlled drug delivery systems can be distinguished (Fig. 2): reservoir systems, monolithic systems, and miscellaneous systems. 1. Reservoir devices with non-constant activity source: In this case, the initial drug loading is below drug solubility and drug molecules (or ions) that leave the dosage form are not replaced. 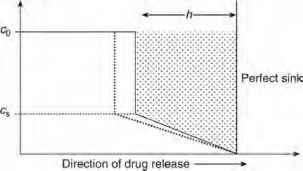 Consequently, the resulting drug concentrations at the inner side of the release rate-controlling membrane decreases with time, resulting in decreasing drug-concentration gradients (which are the driving forces for diffusion). If the properties of the release rate-controlling membrane (in particular its thickness and permeability) do not change during drug release and if perfect sink conditions are provided throughout the experiment (negligible drug concentrations outside of the dosage form), first-order release kinetics result, irrespective of the geometry of the device. 2. Reservoir devices with constant activity source: In this case, the initial drug concentration is greater than drug solubility. Hence, dissolved and undissolved drugs coexist within the reservoir. The drug excess can, for instance, be drug crystals and/or amorphous aggregates. Please note that in Figure 2, the dissolved drug molecules are represented by stars, whereas the drug excess by black circles. Importantly, only dissolved (individualized) drug molecules are able to diffuse, not large drug crystals and/or amorphous aggregates. If the diffusion of the drug through the surrounding polymeric or lipidic membrane is release-rate limiting (and drug dissolution is comparatively fast), released drug molecules (or ions) are rapidly replaced by the (partial) dissolution of drug excess. 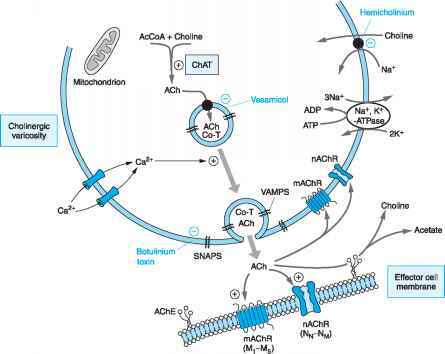 Hence, constant drug concentrations at the inner membrane's surface result (saturated drug solutions). If perfect sink conditions are provided outside the system, constant concentration differences result as long as the drug concentration in the reservoir exceeds drug solubility. If, in addition, the properties of the release rate-controlling membrane (in particular its thickness and permeability) do not change during drug release, the drug-concentration gradients remain constant, leading to constant drug-release rates (zero-order kinetics), irrespective of the geometry of the device. 1. Monolithic solutions, in which the drug is molecularly dispersed within the matrix former. This type of controlled drug delivery system might, for instance, be highly suitable for poorly water-soluble drugs. Individualizing the drug molecules within a (often polymeric) matrix former avoids the dissolution step of the drug during drug release and might enhance the bioavailability. However, care must be taken that the systems are not metastable and poorly water-soluble drug crystals formed upon long-term storage. 2. Monolithic dispersions, which contain both dissolved and dispersed drug (stars and black circles in Fig. 2). Figure 3 Scheme of the pseudo-steady-state approach, which is used for the derivation of the classical Higuchi equation. Assumed drug concentration-distance profiles in a thin ointment film initially containing a significant drug excess and in contact with a perfect sink. • The initial drug concentration in the system is significantly greater than drug solubility. This assumption is crucial, because it provides the basis for the justification of the applied pseudo-steady-state approach allowing for major simplifications. Figure 3 illustrates this concept. The concentration-distance profiles of a drug that is homogeneously suspended within an ointment are shown. The release medium (or skin) providing perfect sink is on the right-hand side. The solid line represents the concentration profile after exposure of the ointment to this sink for a certain time t. Importantly, a sharp discontinuity is observed at distance h from the release medium. For this distance h, the concentration gradient is essentially constant, provided the initial drug concentration within the system, c0, is much greater than the solubility of the drug (c0 » cs) (pseudo steady state). The front, separating the ointment still containing both dissolved and dispersed drug from the ointment containing only dissolved drug, moves only very slowly inward (is virtually stationary), because it takes a long time for all the drug excess to be dissolved at a given position. After an additional time interval, At, the new concentration profile of the drug is indicated by the dashed line. Again, a sharp discontinuity and otherwise linear concentration profiles result. • The device geometry is that of a thin film with negligible edge effects. • The size of the drug particles is much smaller than the thickness of the film. • The carrier material (e.g., ointment base) does not swell or dissolve. • The diffusivity of the drug is constant (not dependent on time or position). • Perfect sink conditions are maintained throughout the experiment. Unfortunately, equation (1) is often misused and applied to controlled drug delivery systems, which do not fulfill all these assumptions. In these cases, any conclusion should be viewed with great caution. Even if the cumulative amount of drug that is released from a particular drug delivery system is proportional to the square root of time, this does not necessarily mean that the underlying drug-release mechanism is the same as in the ointment Higuchi studied. For example, the superposition of various other physicochem-ical phenomena (such as polymer swelling and dissolution, time- and position-dependent changes in the diffusion coefficients of water and/or drug) might result in an apparent square root of time kinetics. Later Higuchi also extended his classical equation to other geometries than thin films (26). However, these equations are implicit solutions and not as easy to apply as equation (1).